A net installer is downloaded to your system when you hit the download Chrome button on the official Google Chrome download page. A net installer, as the name implies, requires a network connection during setup as it needs to contact Google servers to download the browser's components for installation. The installers provide advantages to both the user and Google but also some disadvantages. On the positive side, whenever you run the installer, the latest version of Google Chrome gets downloaded and installed. Offline or full Chrome installers are linked to a specific version which may be outdated. While that is not the end of the world thanks to Chrome's automatic updating system, it still means that you will have to check for updates on first launch to make sure the latest version is installed. Google benefits from net installers as well as it gets more data about the installation process. The installer requires an Internet connection and Google gets data during installation such as the date of installation, information about the system or if the installation fails. Downsides to net installers are that you cannot install them on offline machines, that you may run into issues installing them on devices with slow Internet connections, and that net installers are not ideal if you want to install the browser on multiple machines as you would download it for each device individually instead of just once. Google does not link to full installers on the official download page of the Chrome web browser. but it highlights how you can download an offline installer for Windows on this Support page. Use the following links to download full versions of the Chrome web browser to your computer system. As you can see when you look at the links, it is important to pass the parameter standalone with the value 1, and the channel if you want to download Beta, Dev or Canary versions of Google Chrome. A click on the download button downloads the full version of the selected Chrome edition to your system. The file has a size of nearly 50 Megabytes and highlights that it is the full version of Chrome in its name as well. The installer does not require an Internet connection during setup so that you may install it without having to worry about being connected to the Internet and about the stability of the Internet connection. Note: A 32-bit version of Chrome is not offered anymore by Google. Some sites link to 32-bit download pages but the downloads redirect to the 64-bit Chrome installation file instead. Google does not link to the full Chrome installer on the official download page and many users probably don't know even that an offline installer is available as well. Now You: Do you prefer to download offline installers? Find out how to download the full offline installer of the Google Chrome web browser and not the net installer from the Google website. Gives you better flexibility on where to install it and when to update it, less Google tracking, and even comes without WebRTC or DRM. The only version worth using. This site offers different versions of Chromium, ‘ungoogled’. Sounds a bit arrogant. Do you really believe users don’t know how to find an offline installer for Chrome [or an earlier article, Firefox]? Thanks for saving us Master Martin! Don’t judge everyone by comparing them to your level of knowledge. Just because we can easily found an offline version of a browser without any difficulties, that doesn’t mean that the vast majority of users can do that as well. Unless you’re using a custom build, Chromium unfortunately ships without h264 support, which makes daily use almost impossible. 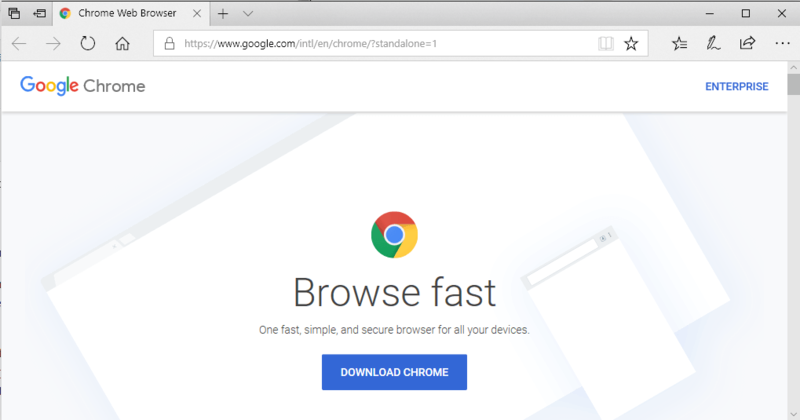 People could also download the Chrome enterprise installer, which still comes with 32bit support. Google does offer 32-bit builds of Chrome Stable, Beta, Dev & Canary. Remove “64” from the end of the (very long & ofuscated) URL, so that the filename ends with “ChromeStandaloneSetup.exe”. Then use the edited URL to download the 32-bit build. (Note the slightly smaller filesize for the 32-bit installer.) This method works for Chrome Stable, Beta & Dev via the landing-page URLs supplied by Ghacks. Either run this PAF installer to install Chrome Stable 32-bit as a portable; OR extract the PAF installer’s “\App\AppInfo\installer.ini” file, open the file in a text editor, & copy the URL indicated after the “DownloadURL=” field. Use a web scraper to gather the relevant direct “clean” (non-obfuscated) download URLs of the offline installers. Note: For all “clean” URLs, instead of the presence of “64” in EXE filename, the 64-bit vs 32-bit URLs are differentiated by a random string that changes with every point-release version. Any info on the offline installer for Chrome Portable? It is most wonderful thing that we can use chrome without internet. Thanks for sharing this great information.